A daily stretching regimen can be beneficial for nearly everyone. If you’re currently experiencing back pain, or even if you’re not, try incorporating the stretches below into your daily routine. 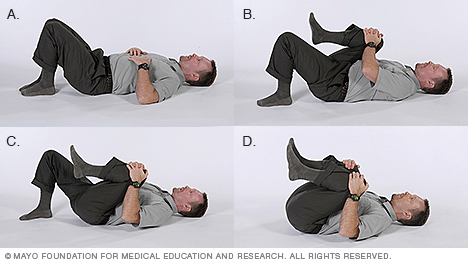 Stretching for back pain relief can be an extremely effective strategy when performed correctly. The following stretches can help to relieve or prevent back pain. As with all exercise regimens, please consult your physician before you begin. (A) To begin, lie on your back with your knees bent. (B) Pull one knee to your chest with both of your hands and hold for 10-20 seconds before returning to the starting position. 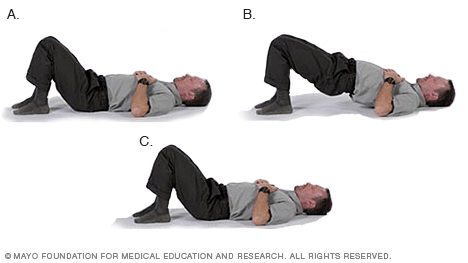 (C) Repeat with your other leg and return to the starting position. (D) Then, repeat the stretch with both legs at the same time. Repeat each stretch 3-5 times each day. (A) Lie on your back with your knees bent. (B) With your shoulders firmly on the floor, roll your knees to one side and hold for 10-20 seconds. (C) Return to the starting position. (D) Then, repeat on the other side. Repeat each stretch 3-5 times each day. (A) Lie on your back with your knees bent. (B) Raise your hips, forming a straight line from your shoulders to your knees. Focus on keeping your abdominal and gluteal muscles tight. 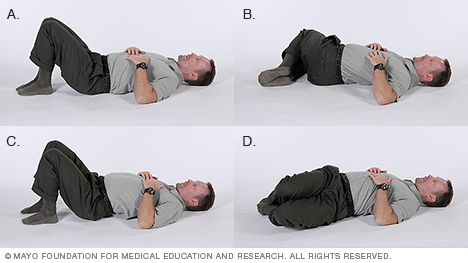 (C) Hold this position for 10-20 seconds before returning to the starting position. Repeat the exercise 3-5 times each day. 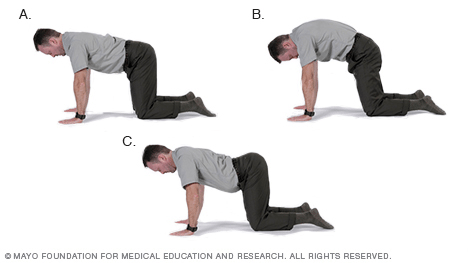 (A) Start with your hands and knees on the ground. (B) Arch your back up toward the ceiling and hold for 10-20 seconds. (C) Slowly arch your back down towards the floor and hold for 10-20 seconds before returning to the starting position. Repeat each stretch 3-5 times each day. The stretches above can be beneficial for anyone, but especially for those suffering from back pain. For more information on stretching for back pain relief and other healthy back tips, please register for our monthly email newsletter. Thank you for the post on stretching for back pain relief. I tried the cat stretch just now and it actually stretched right where the pressure in my lower back was. It didn’t completely fix it but it definitely offered some relief so I will keep doing it. Thank you again for the post. Hi Jaque Christo ,you are right this was a wonderful informative post you have shared on this page about relief of lower back bone pain in home remedies but When you feel pain in backbone then you must go the doctor of physio therapist for a starting of proper treatment with the understanding of exercise steps which is helpful for you in the relief of pain quickly ,but you must apply these exercises in the routine of daily life otherwise your lower back bone will be increase day by day and its dangerous for your health .